WonderSoft Multimedia Solutions builds Android applications with technologies that elevate user experience and cater to your consumer’s specific requirements. 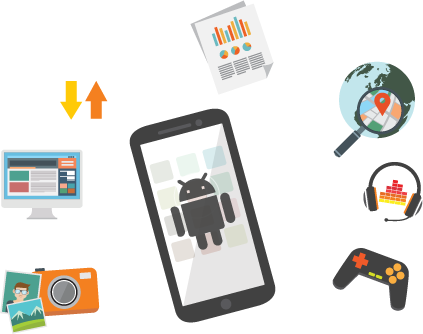 We Have the Talent, Ingenuity and expertise to build steadfast, multifariously efficient and Tailored Android apps. WMS is a full Stack Mobile Apps Development company in India which has been providing android development solution which are business-centric, consumer-oriented and technology-studded. Hire resources with experience in diversified industry domains, on full time or hourly Basis for easily expanding your reach by integrate experts. Android, the brainchild of Google rapidly became world’s #1 smartphone operating system. The technology covers a massive chunk of the market which exceeds all the other competitors. The penetration is to the very fragmented Android market like smartphones, tablets, cars, televisions, and wearables due to which Android has erratically grown. Why Hire Android Developers at WMS? WMS has been in the Android application development business that now apps created on Android by us speak of our niche and forte. We build Android applications with technologies that elevate user experience and cater to your consumer’s specific requirements. We have 5+ years of experience in android application development realm which you can leverage to grant your business an edge over the competition. WMS’s rapid defining & designing coupled with the quick build, integrate and deploy practices ensure a perfectly tailored user experience. WMS developers build android development solution that are business-centric, consumer-oriented and technology-studded. Ready to Work with WMS?